Do you think self-publishing is awesome and totally under-rated? Do you read self-published books? If you're a reviewer do you ever accept self-pubs for review? Why or why not? Are there any great self-published books out there? What about indie-pubs? Do you treat them like self published books? What do you think about those who just self-publish electronically vs. those who print physical copies? 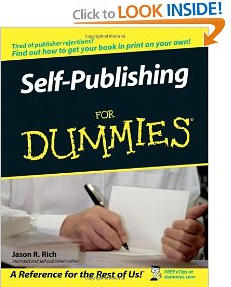 Are you a self-pub author? Why did you decide to go that route? I want to hear it all! I'll join in the conversation in the comments. Anonymous comments are fine, just be sure to see my "be courteous" note below. Any cruel/unnecessarily rude comments will be deleted. I admire self-pub authors for believing so strongly in their product. As a reader/reviewer, I've recently been burned by self-pub books and so I'm taking a break from them. In addition to editing, plotting and pacing issues, the last one I started reading had sexual content that was completely inapproriate for a YA book. I have also come across a lot of the same content issues from indie publishers. I am not lumping all self-pub/indie-pub books together but right now, I'm not reading or reviewing them. I'm sure I will come back to them later and try some new authors. Self publishing is such a tricky thing. I've read some amazing self published novels, and sometimes it could even get an author noticed such as Eragon and Legacy by cayla kluver. So I try not to judge a book by being self published. I will read the summaries and some other reviews if there are already some on goodreads before accepting them for review. But I've read some really really bad self published books because anyone can self publish them! I actually know some one personally who self published her book, it's very good. Sure a publisher could have fixed a few things but i think the only reason it didn't get published because it wasn't one of the 'trending YA topics' like dystopian or paranormal. For indi publishers, I have worked with some that publish amazing novels and other that don't. It can go both ways just like self-publishing. I am a blogger who's blog reviews 80% of it's content to self published books. I think that every book avail for purchase by a consumer deserves a review to be reviewed. So far I have only had good relationships with self published authors and have had no negative responses to my reviews/opinions I have posted. I think of "self published" as a personal business, you write the book, you promote it and you put it out there for purchase. If you work with an "indie publisher" than I consider it a published work. Most of the best reads I have found this year I have bought for under $1 on my kindle and would highly recommend Exiled by M.R. Merrick, Intangible by J Myers and Edens Root by Rachel Fisher, and those are just books I read in the last few months! I have several more that I can list for you. I am a strong believer that everybody deserves a chance to get their work out there and I am more than willing, if the book suits my tastes to give that book a try and review it for them and encourage my friends and twitter followers to try it out as well. I am very open minded and as long as the summary and the review query to me is honest and the book really does encompass what they say it does, then overall it's a happy relationship. I have had experiences where I am told I am venturing into a YA book, and on at least 2 occasions I have been shocked by the content in those books, I will tell the author that I do not think their book should be promoted as YA because I know there are younger bloggers (13-14) that I would be appalled that they were approached with such a read without having knowledge of it's content, queries have to be clear and detailed or my review will reflect that as well. Overall 99% of all my interactions have been positive. I get at least one review request a day and keep very busy and for the most part have enjoyed all of the stories I have read. Keep an open mind, and if it's not for you be honest with the author, and if you know somebody that may enjoy it, refer the author to that person. I do believe that if I ever wrote a book, I would do everything in my power to get it published, but even after years of trying, sometimes there just might not be a market looking for it, and you do what you have to do to get it out there. I'm not a fan to self-published novels. I figure it the author can't get published by a legitimate publisher, then they're probably not worth my time. I know it's unfair to lump all self-published books in that category, but there are so many published books out there that I want to read, I have to be picky and choosy. Every now and then a self-published novel will catch my eye and I'll accept it for review, but very rarely. PS--I tread Indie books like self-published books. 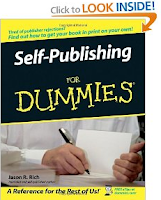 To be honest, it bothers me when a self-published author calls themself a "published author." Because no, you weren't published. For SOME reason your book wasn't good enough for a publisher, or wasn't what the market is interested in right now. Anyone can self publish so long as you have a computer and a little money. A TRUE published author is someone who went through the query process and was accepted by a publisher. No disrespect meant. It's just my opinion. It frustrates me that publishing has been cheapened by e-publishing. I am less than thrilled about self-publishing. It's the new it thing to do and it's allowed all those people who feel writing a novel is some fleeting thing to "publish" their work and call themselves an author. It is absolutely NOT a legitimate form of self-publishing. That's as deluded as me saying I'm the same kind of book reviewer as those that write for The New York Times. Legitimate publishing requires a vetting process of objective, educated readers. Or gate-keepers as a lot of people might call them. I'm okay with that because I, personally, want legitimacy. It devalues it a bit when all you need to get "published" is Word and some minimal Photoshop skills. I do think the method is underrated, obviously, simply because it harbors so much crap. Self-publishing can be good and has proven to be good but, in my experience, you have to wade through a hell of a lot of muck to get to it. If done properly self-publishing can be a really good way to get your work out there but it's HARD and I think a lot of people don't realize that. Those few authors that end up selling enough to get the attention of traditional pubs have the time and resources to do that. For everyone else it's just not reasonable. I don't read self-published books anymore and I don't accept them for review mainly because their quality is really low but more than that I've found self-pubbed authors to be wholly unprofessional. In my experience, of course, they're the ones throwing my review policy to the wind and trying to shove their books down my throat anyway. It's gotten quite bad and I am on the verge of snapping at people that keep trying to get me to read their books without a shred of consideration for my policy. So for me it's more about the authors than the work. I may not be a professional but that doesn't give people free reign to do whatever the hell they want. For indies I need to be careful because I have had bad experiences with indies and their rather lax submission criteria. While it's a "traditional" way to publish, complete with vetting process and all, some of their standards are a little low for my tastes. I should read a book and question whether it's a vanity press or self-pub when it's an "indie." I may sound like a snot but my opinions have been formed from experience. I'm choosing not to deal with self-pubs. And even when I take that stance I still get people trying to force them on me. The answer is no. That should be "I shouldn't read a book and question . . ."
I've read some self-published books, paper back and ebook, for review on my blog. Some have been amazing like Cobbogoth by Hannah L. Clark and Remembrance by Michelle Madow, but others have only been mediocre or really bad. There are books that have been published by bigger publishing companies I didn't like either so I try not to lump all self-published books together. I take each book one at a time. It's hard to read all the self-published ebooks I get because I just don't have time and there are so many, and I have a ton of other books I want to read. I definitely admire self-published authors, but I don't read self-published books. Sadly, I don't have a good reason except that I've heard that a lot of them are pretty bad. Most of the requests I get are from self-published authors, and before I even see if they're self-published, I learn more about the book. Most often the plot sounds unappealing. Occasionally it interests me, but then there's the problem that they're eBooks, and I very clearly state in my review policy that I don't accept eBooks. I've accepted one self-published book that I'm looking forward to, but I made that exception after hearing the authors publishing story and being genuinely interested in the book. So in general I don't accept self-published books, but I will make occasional exceptions. I've been "buying," or rather, downloading, a lot of the free Kindle books. They're the perfect way to quench my book buying habit. Most of them are self-published, and I honestly haven't gotten to reading many of them yet. The one I have read was somewhat disappointing, but I think there's some good stuff out there. Finding it is the hard part, but I read quickly enough that I don't mind skimming or reading through a lot of them. When I write the review policy for my blog, I'm going to encourage self-pubs. I do admire writers who self-publish. That is to say, writers who take the time to put out something that isn't a first draft, riddled with errors, piece of junk, product. E-publishing is really getting going, and I think the opportunity is there. Look at someone like Amanda Hocking, or E.L. James. I plan to self-publish something this year. It's a goal of mine, and I have it for a few reasons. One, I'd like to learn more about it. Two, I think it's a good opportunity to learn about marketing yourself and your product. Three, it's a goal that will hopefully push me into writing something original. Plus, I'm impatient, and I want some sort of gratification that it's worthwhile for me to continue working on my writing. I believe self-publishing will give me faster feedback. My opinions on this may change; I'm just diving into this area, and I'm sure there's a lot I don't know, or aren't aware of. I have mixed feelings about self-published books; they're pretty hit and miss. First, I admire self-published authors for having the courage to feel passionate enough to put their work out there. Especially when self-published works get a bad wrap. I've run into a few self-published books that were decent. They didn't blow my mind, but with editing and revising, they very well could. The stories were unlike the others that have saturated the market which might explain why the author had to turn to self-publication-- their topic just wasn't trendy enough. But, for the most part, the self-published books I read were just bad. I commend these authors for fulfilling a dream, but most people aren't born to be storytellers. I'd love to read more self-published works, but I have to dig through so much crud that it's almost not even worth the time. Since I've gotten a kindle I have started giving more a chance and found a few I really love like Exiled by MR Merrick and Cornerstone by Misty Provencher. I think that anyone who self publishes needs an editor and these days many more are hiring them. I consider Indies to be about the same. I think anyone who spends that much time writing something deserves to be published. Publishers can only accept so many. And what I hate is that publishers often have the authors change the entire story anyway. Plus the book is then no longer theirs, it pretty much belongs to the publisher. Yeah, being published by a big press would be nice but at least now there are more options. I think self-publishing is a great way to get yourself on the market, especially if yo've had problems getting published. However, since its s easy nowadays to self-publish many books get through they really shouldn't. PLEASE- authors, check your books for grammer and get someone to edit them who is not your Mum. I do review self-published books for one simple reason- I want to help those who are good writers to stand out from the crowd. I always write honest reviews and that seems to filter out some of the rubbish. I'm just waiting for the first critical response to one of my reviews though- I haven't had one yet. Hm, it's sad to see how many people have been "burned" or don't really enjoy self-pubbed books. We think that's not a reflection on the IDEA of self-publishing, but on the REALITY of it at this particular time. It's still new and young, and the kinks are still being worked out of the system. Hopefully as time goes on, it will continue to improve, and the quality will rise, etc. Personally we don't read a LOT of self-published books, but that's not b/c we're against them. Almost all our reading is picked up by recommendation. If someone whose taste we trust recommends a self-published book, then we'll check it out, just like any other book. That just doesn't seem to happen as often. I published through Amazon and I always considered self-publishing and Indie to be the same...maybe I'm wrong? Anyways, I chose this route for a few reasons. The first being I don't want to wait years to see my book published, if ever. It isn't that I'm overly impatient, but I think that is a ridiculous timeline. It can take years to get an agent, and years after that for them to find a publishing house for it. Once that happens, it's 18 - 24 months still before you book hits book stores. It's an archaic process, at best. Second, money. I didn't publish only to see a dream come true. My dream wasn't just to be published, it was to be published and hopefully one day have a full-time writing career. With a 17% royalty on eBooks, and even less on physical copies, the people that create the publishing industry (authors) by providing it with content, make the least amount of money out of everyone involved. It's harder than ever to make a living writing stories. With Amazon, I make triple what I'm paid for at my day job, and I sell a few thousand copies a month. Mostly my books are enjoyed, but like anything, you cannot please everyone. Self/Indie publishing has given me the opportunity to make that dream a reality, get paid a fair royalty, and my books are more affordable for people than they would be if I traditionally published. All that being said, I am not against traditional publishing. I'm not a hater by any means, but for me, self or indie publishing was the right path. Not to mention I wanted full control of the entire process. I don't want to be told how to change my story so that it fits the "market," or what my cover would look like. I created this story, I want a say in what it looks like on a bookshelf, and how the finished product is told. I'm open for suggestions, but I won't re-write to fit any other books that have gained popularity. I work hard to produce quality work. I pay two professional editors to polish my work. One for content, development, characters, etc., and a second for copy editing; grammar, spelling, sentence structure. I hire a professional cover artist that doesn't use "free stock" photos. I have eye-catching (or so I'm told), and unique cover art. I market my books to reviewers that do accept indie/self-pubbed work, and I welcome both positive in critical responses. I work hard to deliver a story that I hope readers will enjoy, but after reading all these comments, it saddens me to think there are still many out there that don't believe I'm worth their time. Even though I put myself though a rigorous editing process and hire professionals to work with me, I'm still lumped in with the author who wrote a few thousand words down and clicked publish. Although I understand why, it really is too bad. Hunger Games Nail Polish Giveaway! March's New Release Giveaway, February Winner!